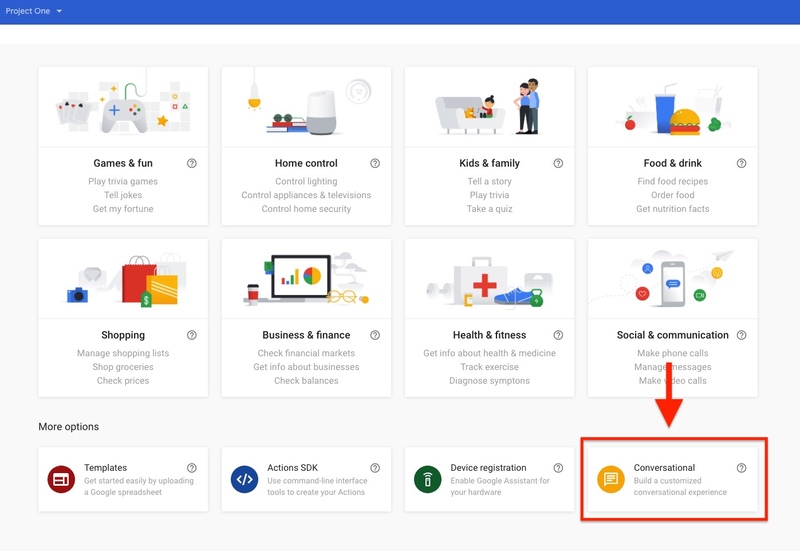 Create an account on Google Actions (if you haven't already). 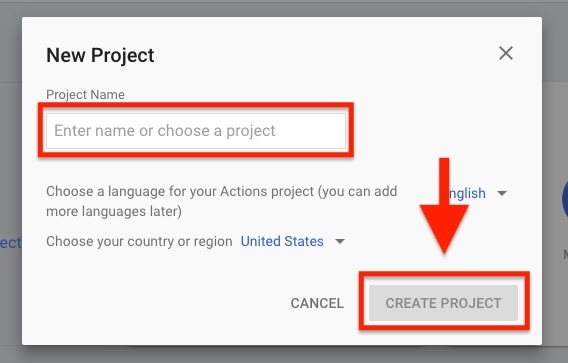 You must create this account to link your project to Google Actions and Dialogflow. 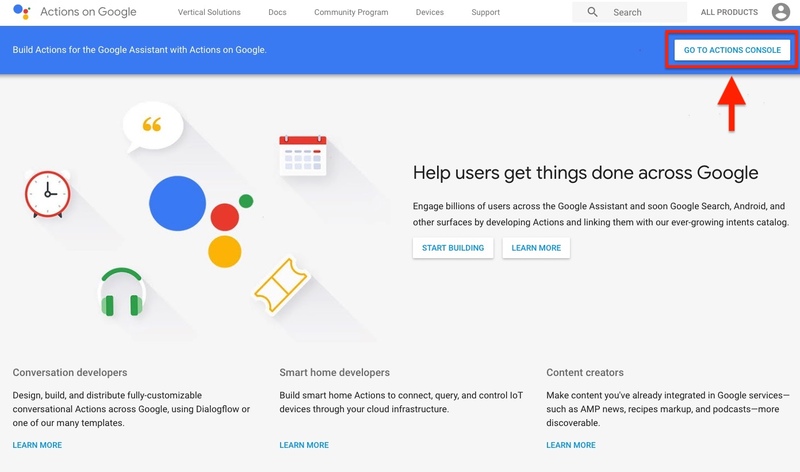 Visit the Google Actions Homepage. Click [Go To Actions Console] and log in your with Google account. You can think of a Google Actions project as the Google equivalent of an Alexa skill. 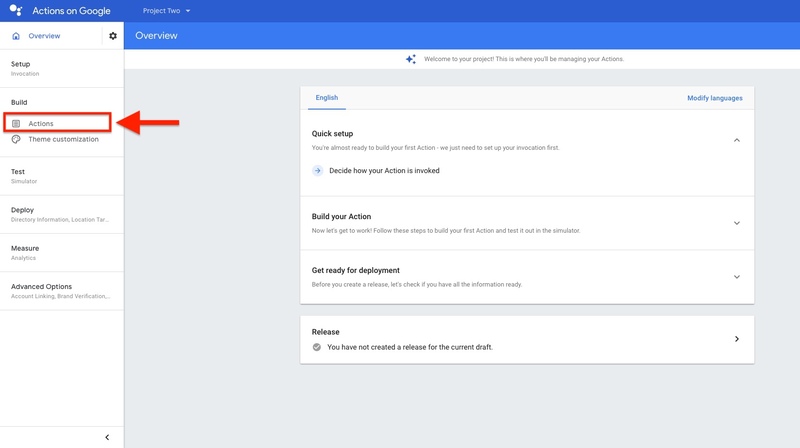 However, on the Google Assistant platform, for every unique skill you wish to publish, you must create a new project on the Google Actions console. 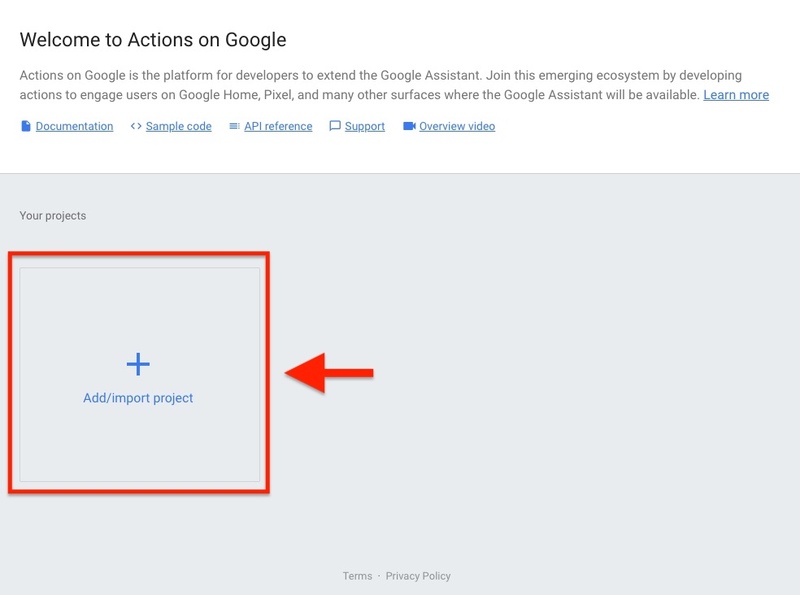 To create a new Google Actions project, hit [Add/Import Project]. Enter a Project Name and click [Create Project]. Select the [Conversational] template in the bottom right corner. 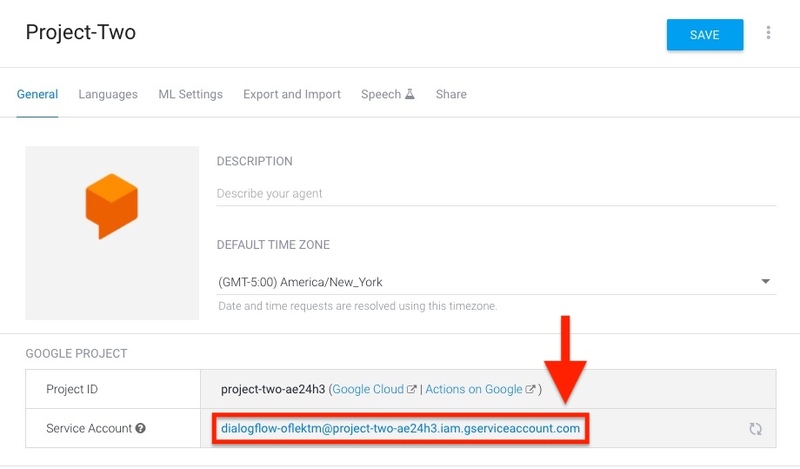 This will allow you to connect your Google Actions project with a Dialogflow agent ⏤ a requirement for integrating with Voiceflow. Your Google Assistant project is now created! We'll attach a Dialogflow agent to it in the next section. Dialogflow, another Google service, is used as Google Assistant's NLU engine. It receives your choices, intents, and slots (called "entities" in Dialogflow) and creates a language model that will be used in your skill. 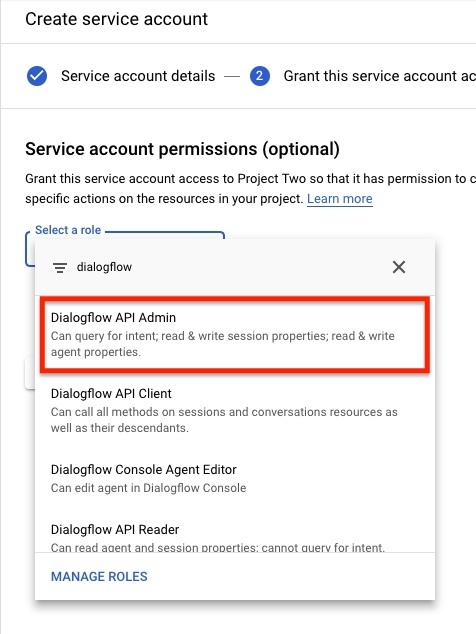 Along with a Google Actions project, you will also need to create a new Dialogflow agent for every Voiceflow project that you wish to publish to Google. You should now be at the home page of your project on the Google Actions console. Click on [Actions] in the menu bar to the left. A 'Create Action' pop-up should appear. 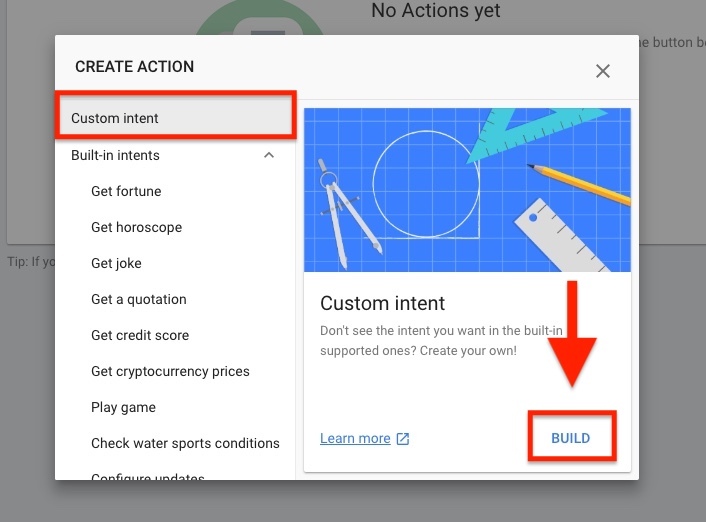 Select the Custom intent option and click [Build]. This should open the Dialogflow Console in a new tab. 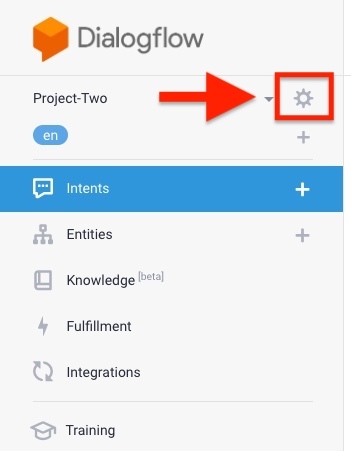 If you see your project name (Project-Two, in this case) and the phrase "Agent will be linked with [project id] Google Project" in the 'Google Project' section, your Google Actions project has been successfully linked with Dialogflow. If you see a blank agent name and no listed project in the 'Google Project' section, you are logged into the wrong account on Dialogflow and must log out. 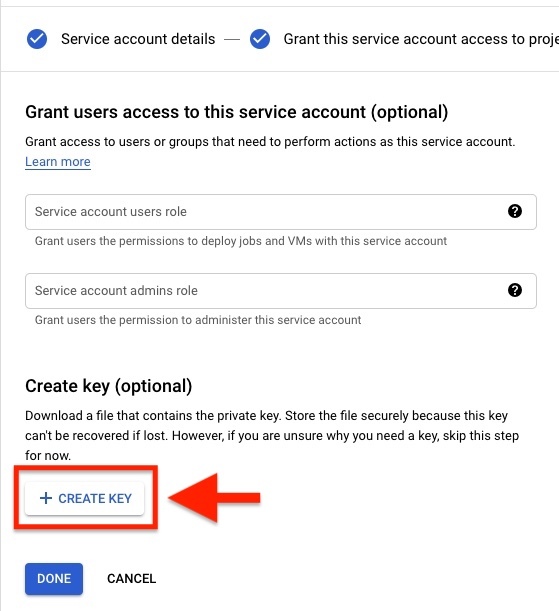 Log back in with the same Google account that you used to create your Google Actions project and repeat the steps in this section. At this point you have successfully created your agent. Hooray! Now you will need to generate a set of credentials which allows Voiceflow to manage your project on your behalf. Click the settings icon on the left menu bar. Click the 'Service Account' link. This will take you to the IAM & Admin service accounts page. If you get an 'Unauthorized Access' error message, you might be logged into the wrong Google account. On the IAM & Admin service accounts page, log back in with the same account that you used to create the Google Actions project and Dialogflow agent. From the IAM user management home page, click [CREATE SERVICE ACCOUNT] at the top. Name the account 'Voiceflow Creator Tool' and click [CREATE]. On the next page, click on the 'Select a role' box, and filter by 'Dialogflow'. Select the role [Dialogflow API Admin]. Voiceflow will use this service account to manage your Dialogflow agent for your Google Assistant project. 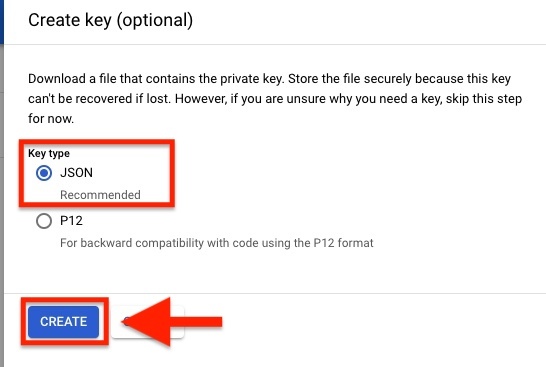 Upload the file you just downloaded to Voiceflow in the Google publishing page under the 'Google Assistant Credentials File' field.